Raymond, now 75, is a regular visitor all the way from Toulouse home to the airbus A380 currently the largest flying passenger aircraft in operation. A long way from home, Raymond is part of the "family" here in Twizel. He stays with Kevin and Glenys and I look after him during the day. Hard to find a more pleasant and polite gentleman. Maybe it's because of his long career as a school teacher? Either way, it's a pleasure to be out on the water with him and we do make a pretty good team! The weather treated us kindly and being the opening of the season, the trout were cooperative as well. We didn't break any records for distances covered on the river bed. We just potter along. 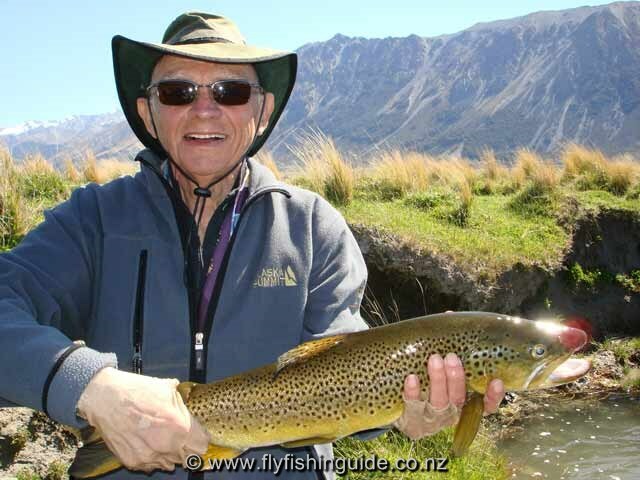 In his 10 day stint Raymond hooked 82 trout, landed 40. Normally I would be a little disappointed at that "strike rate" but we lost a number of the "bolters" as they sped up or down the pool. 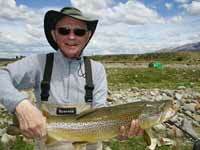 It's always far better to play a trout on a short a line as possible. Letting them get away usually results in a lost fish, especially if the said fish has built up a head of steam! Never mind, c'est la vie - the fish have to win sometimes. If I'm still able to get around as well as Raymond at age 75 I will be more than happy and if a few trout get away because I can't sprint after them then so be it! A happy Raymond with a lovely brownie. Note the gloves. Another nice fish about to be released by Raymond.